Hours after being admitted to St. Mary's Hospital in London, Kate Middleton - the Duchess of Cambridge - delivered an 8 pound, 7 ounce son on Monday morning, Kensington Palace said. The duchess, 36, and Prince William, Duke of Cambridge, 35, arrived at St. Mary's Hospital in London by car. The baby boy is the couple's third child and grandmother Queen Elizabeth II's sixth great-grandchild, and become fifth in line to the throne. LONDON (AP) — Third time's a charm. The Duchess of Cambridge gave birth Monday morning to a new prince who is fifth in line to the British throne — and she was home by suppertime. Princess Charlotte had a huge smile on her face as she prepared for her first day of nursery on Monday (08.01.18). The two-year-old daughter of Prince William and Duchess Catherine smiled widely as she posed for photographs on the steps of Kensington Palace ahead of her first day at the nearby Willcocks Nursery School. Princess Charlotte is set to attend London's Willcocks Nursery in January 2018. The two-year-old royal - who is the daughter of the Duke and Duchess of Cambridge - is growing up quickly and she is set to take her first steps into education in the New Year when she officially starts at the educational drop-off in Kensington, London, in a few weeks' time. The palace says Monday that the five-day tour beginning July 17 in Warsaw will feature appearances by the royal children. The trip is being seen as an effort to bolster Britain's goodwill ties with Europe amid the country's negotiations to leave the 28-nation European Union. 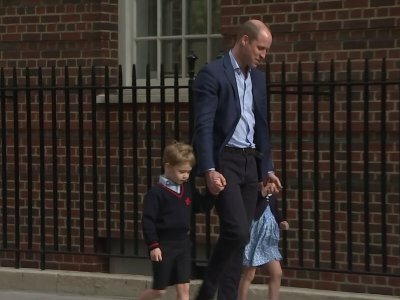 LONDON (AP) — Prince William says he is sad his wife and two young children can't meet his late mother, Princess Diana. In an interview with the magazine British GQ, the heir to the throne opened up about his feelings about his mother's 1997 death in a Paris car crash. William told the magazine he would have liked having his mother's advice and for her to meet his wife, Kate, and to see her grandchildren grow up. ENGLEFIELD, England (AP) — There were hats and morning jackets and British royalty galore, all coming together to celebrate Pippa Middleton's wedding. The 33-year-old bride, sister of the Duchess of Cambridge, had two likely future British kings and other members of the royal family looking on Saturday as she married hedge fund manager James Matthews, 41, at a rural English church. LONDON (AP) — She played a memorable supporting role at sister Kate's 2011 royal wedding, but Pippa Middleton will take center stage Saturday at what looks to be Britain's high society event of the year. The 33-year-old is marrying a wealthy financier at the oh-so-English 12th-century church of St. Mark's in the village of Englefield, west of London — with a guest list of young A-list royals and reality TV stars looking on. LONDON (AP) — It's nearly party time for Britain's Princess Charlotte, who celebrates her 2nd birthday on Tuesday. LONDON (AP) — Senior royals have joined Queen Elizabeth II to celebrate Easter with a special service at Windsor Castle. LONDON (AP) — Look for Prince George and Princess Charlotte to steal a few hearts when their aunt Pippa Middleton marries next month. Kensington Palace said Monday that George, 3, and Charlotte, 1, will be page boy and bridesmaid at the May 20 nuptials of Middleton and financier James Matthews. VICTORIA, British Columbia (AP) — Princess Charlotte took her first steps in public on Thursday as she and brother Prince George played in a children's party with Prince William and Kate. The 1-year-old Charlotte immediately bee-lined for some colorful balloons before heading to the petting zoo for some time with the goats, sheep, rabbits and miniature horses. VANCOUVER, British Columbia (AP) — Prince George and Princess Charlotte stayed behind with their nanny as Britain's Prince William and his wife, Kate, continued their tour of British Columbia on Sunday, a day after George left Canadian Prime Minister Justin Trudeau hanging on a high-five. LONDON (AP) — London police say they have arrested a 35-year-old man suspected of hacking the iCloud account of Pippa Middleton, the younger sister of the Duchess of Cambridge, and stealing 3,000 photographs.